Everyone loves film noir, even though it’s the genre that never was, seeing as the name was made up retrospectively by French intellectuals. The term refers to a body of films that share similar stylistic elements; but these films are really ‘just’ 1940s and 1950s American crime thrillers. It’s the huge range of film styles covered by the term ‘film noir’ that make it less than useful. But that range is well represented here: pulp crime story, dark gothic fairy tale, high-minded moral drama, gritty police procedural. 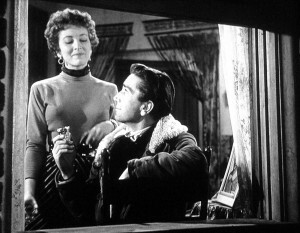 There’s perhaps one big omission, the working-class noir (although Force of Evil gets close in this regard). The Dark Mirror has a pure pulp storyline with a mid-1940s psychological update. One of a pair of identical twins (both played by Olivia de Havilland) has perpetrated the perfect murder, as no one can tell the twins apart and one of them has an alibi. It’s up to suave psychologist Dr Scott Elliott (Lew Ayres) to get his Rorschach cards out and sort the angel from the demon. To the present-day viewer, it’s as clear as daylight from the first scene the twins share together (thanks to special effects by Eugen Schüfftan) which one is the wrong un, but there you go. Secret Beyond the Door is a real re-discovery, a nicely literate gothic tale of terror which gives the Bluebeard story a Hollywood psychoanalytic overcoding. Shortly after their marriage, Celia (Bennett) begins to wonder about her fey Brit architect husband Mark (Michael Redgrave), his obsession with infamous historical crimes of passion and the locked room in his lavish home. Secret Beyond the Door must be one of the few movies of this or any period that features twin narrators, used here to suggest a Psycho-style early exit by the main character. Force of Evil is the moral drama of Joe Morse (Garfield), a mobbed-up lawyer involved in the numbers racket, whose Achilles’ heel – and moral redemption – is his attachment to his brother. This is a justly famous, righteous drama, that’s perhaps a bit too stagey at times, but with wonderful, rounded and human performances by the entire cast, especially Marie Windsor and Beatrice Pearson. Lovelorn cop (Wilde) goes up against ruthless gangster (Conte) in The Big Combo, which is often held up as the ultimate example of 50s noir, focusing as it does on police procedure and male characters rather than ‘femmes fatales’. 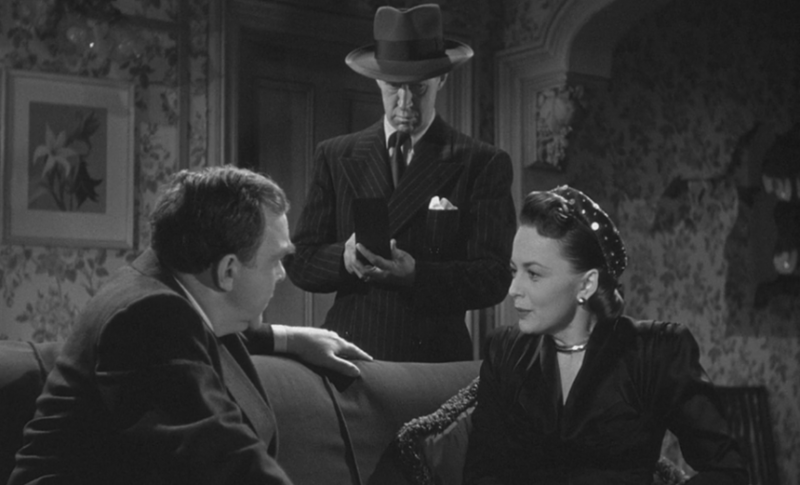 But the film no longer lives up to its big reputation, except in the case of John Alton’s quintessential noir lighting and compositions. As a psychological drama it doesn’t get off the starting block, everyone is a walking, talking cliché, with the script’s attempts at character motivation only motivating laughter. As a police procedural, it’s fatally non-credible; and Cornel Wilde is a total mood killer of an actor. Even the snarling presence and snarling one liners of the great Richard Conte seem edited and restricted, leaving key sequences such as the opening chase, a torture sequence and a night-time ‘hit’, to do most of the work of impressing. A young Lee van Cleef is excellent as a murderous heavy trying to out-snarl his boss. The actors, directors, cinematographers and composers showcased here are the stuff of legend. As well as the names mentioned above, John Alton ‘lenses’ The Big Combo to jaw-dropping effect in key sequences, although I don’t think the resolution here is as high as it is in Force of Evil or Secret Beyond the Door. Stanley Cortez shoots the gothic detail exceptionally well in Secret Beyond the Door. Dmitri Tiomkin and Miklos Rosza turn up the drama with their orchestral scores. Limited to 2000 copies and packed with superb extras, this dual format box set also comes with a highly-collectable hardback book on all the films. ‘Four film noir classics’ is out in a dual format, boxed set edition on 20 November.